Anna Hamilton, food writer and operator of local supper club Alright Treacle, takes a break from her regular foodie adventures to give us a run-down of Edinburgh's finest petal-merchants. 2 Gillespie Crescent, Edinburgh EH10 4HT, roseandammiflowers.com, 0131 228 6059. Open Mon-Fri 10am-6pm, Sat 10am-5pm. Lydia Cywinski opened Rose & Ammi almost two years ago, transforming a disheveled old nail-bar in to a simple and serene ode to flora, selling stunning stems as well as a fascinating array of seedpods, cacti, grasses and all sorts of marvellously obscure dangly things. The high, pale-blue ceilings are sparsely decorated with well-structured planters and pots (predominantly from Scandinavian suppliers) that emphasise the feeling of ‘less is more’. Having not worked in a florist before setting up her own has put Alice in good stead, as she has a delightfully refreshing approach – that plants and flowers are not only there to add colour, but to ultimately accentuate the design of one’s living space. Haddington, East Lothian, pyrusflowers.co.uk, hello@pyrusflowers.co.uk. By appointment only. Not exactly a florist, more of a floral pioneer, is Pyrus, founded by creative minds Natalya Ayers and Fiona Inglis, who (after becoming disillusioned by the Dutch flower industry) decided to set up a company that championed locally sourced and home-grown plants and flowers. Their list of projects and commissions include a heady mix of weddings, botanical installations, events, styling and art direction, growing all their own flowers in a walled garden over the summer months (then drying them for winter). One of their latest installations will be on show at the Hidden Door festival this year – an exciting artistic collaboration, raising awareness on the decline of the honey bee, a topic understandably close to their hearts. 87 Broughton Street, Edinburgh EH1 3RJ, narcissusflowers.co.uk, 0131 478 7447. Open Mon-Sat 9am-6pm, Sun 11am-5pm. Well-established Edinburgh florists Narcissus are coming up to their 18th year on Broughton Street. It was originally set-up by Sharon Nugent, who now has a bevy of employees and budding selection of apprentices keen to learn the craft from this Edinburgh institution. 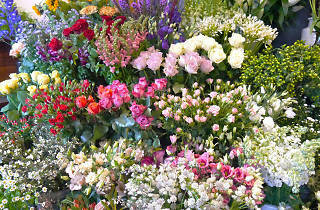 It’s a beautiful shop to behold, and exactly how a florist should be – full (and I mean full) of bountiful blooms. As well as the shop, Narcissus run seasonal floristry workshops at Gayfield Creative Spaces, including ‘The Wiring Masterclass’ and ‘A Celebration of the Daffodil’, bringing together flower fanatics from all over the city. 5A William Street, Edinburgh EH3 7NG, rogueflowers.co.uk, 0131 226 4999. Open Mon-Fri 9.30am-6pm, Sat 10am-5pm. 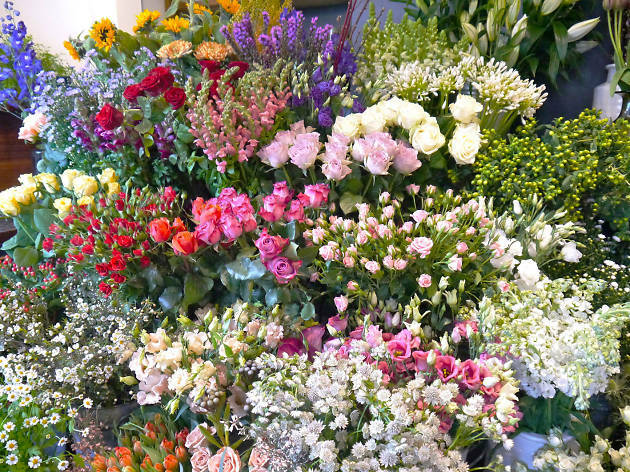 Situated on William Street, Rogue Flowers reminds me of a quant, village-style flower shop. It was founded in 2010 by Alice Shaw who, while studying at University, stumbled across a love for flowers after working in her local florist. Although centrally located, the shop has a countryside feel (admittedly, I hoped every customer coming in would be wearing wellies), with her delightful wee pooch Balfour taking centre stage. Over the past five years, Alice has accumulated an impressive list of commissions, including large-scale events at The Museum of Scotland and the International Film Festival’s opening and closing parties. 42 Ashley Terrace, Edinburgh EH11 1RY, pollination.co.uk, 0131 313 1011. Open Mon-Fri 9am-5pm, Sat 9am-2pm. A hop, a skip and a jump away from my usual Edinburgh meanderings is Pollination - originally set up from home by Gill and Nik Wilson, who started by making bouquets for corporate functions, until they moved in to their premises in Shandon almost 17 years ago. Slightly out of town, but definitely worth a visit, they are a passionate pair, and their contemporary styles and emphasis on exotic flowers (inspired by years of travel) have provided them with a strong and steady following, particularly after focusing on an online presence in recent years, with their hand-crafted bunches being ordered from across the UK (and the Atlantic!). Alright Treacle is a supper club that operates on Saturday nights from an Edinburgh city centre location. Their next event is on Sat Mar 14 - visit alright-treacle.com for more info and booking. In addition to Alright Treacle, Anna also blogs about food at itsrudetostare.com and tweets @alrighttreacles.